At Golden Oldies Auto Sales we offer financing thru a large variety sources including Local or National Banks as well as Finance companies and Credit Unions! We have finance programs for everyone whether you are a Credit Superstar, Average Joe or had your fair share of bumps in the road we've got you covered! At Golden Oldies we understand that bad things can happen to good people and we have a solution that will help get you into the Car, Truck, Van or SUV that best suits your needs! With our discounted Used Car prices, Rates as low as 1.99% and extended terms available that Used Car, Truck, Van or SUV may be more attainable than you thought! 2 Locations serving greater Pasco and Hernando counties as well as Hillsborough, Pinellas and beyond! A wide range of inventory with over 200 pre-owned Cars, Trucks, Vans and SUV's in stock! We facilitate financing from a variety of local and nationwide Banks and Credit Unions as well as the occasional Buy here/Pay here loan! Sales representatives and Managers that have a combined 250 years of Experience with the average tenure at Golden Oldies of 13 years ! An onsite full repair facility and detail shop! 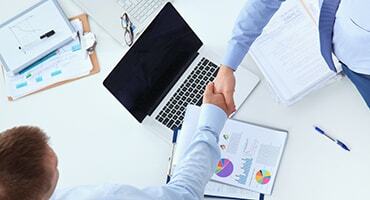 Warranties on most cars with extended warranties available! Come find out why Golden Oldies is Your Hometown Dealer. At Golden Oldies we understand that purchasing a pre-owned vehicle can be an emotional and scary process, often the mechanical condition as well as critical safety items are overlooked well our 75 Point Inspection can help eliminate much of the anxiety associated with the unknown. Our Master Techs perform a full 75 Point comprehensive used car inspection on all of our Cars, Trucks, Vans and SUV's and most vehicles come with a 30 Day Warranty to help you feel more confident in choosing Golden Oldies! In addition to our used car inspection we also have a full service Detail Department to help make that new-to-you vehicle look as good and fresh as possible! Golden Oldies Your Hometown Dealer...Since 1991! 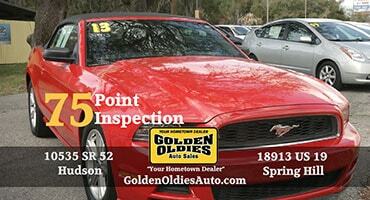 Golden Oldies Auto Sales Pre-Owned has great deals on Used and pre-owned vehicles in the Hudson and Spring Hill areas. Whether you're looking for a Pre-Owned SUV, Car, Truck or Van or any other used Vehicle, you're sure to find a model that suits your needs and budget in our Inventory and featured vehicles area. 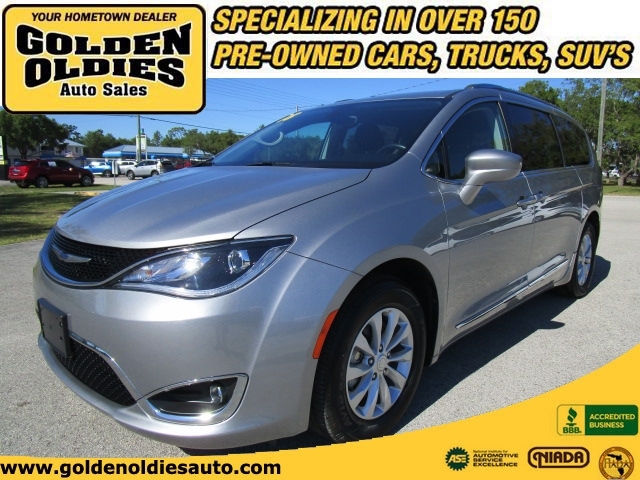 These Used Cars, Trucks, vans and SUVs have been carefully selected from the immense pre-owned inventories at Golden Oldies Auto sales to appeal to a wide variety of Hudson, Springhill, Tampa and Pasco motorists. Why not take a moment to browse through them? We're happy to arrange a test drive or get you a great quote on one of the vehicles you see below. Your next car, truck, SUV or van purchase is right here at Golden Oldies Auto Sales Pre-Owned! Please check us out at either of our 2 locations. 18913 US Highway 19, Hudson, FL 34667, Corner of Us 19 and County line Rd, or 10535 SR 52, Hudson, FL 34669, on State Rd 52 5 miles west of the Suncoast Parkway.